At least half of all UK banknotes in circulation are held overseas or used in the black market, a Bank of England report suggests. The Bank, which is the main issuer of banknotes in the UK, said only about a quarter of cash in circulation is being used to buy and sell things. Some is being hoarded, outside of bank accounts. Much is held for travel money overseas or used illegally in the "shadow economy", the Bank said. Banknotes with a value of £62.6bn were estimated to be in circulation at the end of July, according to the latest figures from the Bank. That is the equivalent of £1,000 for every person in the country. Recent industry figures showed that the number of cashless payments in the UK had overtaken the use of notes and coins for the first time. Card use, such as contactless payments, and digital transactions using smartphones are on the rise. Yet, the value of banknotes in circulation has tripled over the last 20 years, according to the Bank's report. "Over the next few years, consumers are likely to use cash for a smaller proportion of the payments they make," it said. "Even so, overall demand is likely to remain resilient. Cash is not likely to die out any time soon." 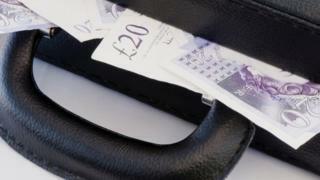 The Bank report suggested that between 21% and 27% of total UK cash was being used for transactions at any one time last year. The rest was in various places including being "buried in the garden". "People may choose to save their money in a safety deposit box, or under the mattress, or even buried in the garden, rather than placing it in a bank account," the Bank warned. Some UK currency is hoarded by overseas visitors - either keeping it after returning from a trip to the UK, or as a store of value. Cash is also used in the darker side of economic activity, the Bank added. "The evidence available indicates that no more than half of Bank of England notes in circulation are likely to be held for use within the domestic economy for legitimate purposes," it said. So a chunk is used in the "shadow economy" - either legitimate activities concealed from the authorities, or illegal activities and transactions. Some is also kept by criminals and tax evaders. The report suggests that the size of the shadow economy has not mushroomed. "Activity in the shadow economy has not seen significant growth, so transactional holdings of cash in the shadow economy are unlikely to have been the primary driver of the growth in banknote demand in recent years," it said. Cash will see a significant overhaul in the coming years, with a new 12-sided £1 coin entering circulation in 2017 and plastic £5, £10 and £20 notes being introduced by the Bank of England in the next five years. Banknotes are not only issued by the Bank of England in the UK. Seven commercial banks have permission to issue banknotes in Scotland and Northern Ireland. In Scotland, they are: Bank of Scotland, Clydesdale Bank, and The Royal Bank of Scotland. In Northern Ireland, they are: AIB Group (UK) plc (trading as First Trust Bank), Bank of Ireland (UK), Northern Bank (trading as Danske Bank), and Ulster Bank.